The Omega Recoil team had a lot of fun showing off our experimental coil, Jacob’s Ladders, and allowing for more audience participation than with our 9 foot Tesla coil. The audience in the yurt could even hear us when the coil wasn’t actively firing. Here’s one shot of the audience in the yurt learning that experiments often fail. In this experiment we learned that the “Radio Fryer” Tesla Coil does not get hot enough to ignite sparklers. We also had a chance to play with various fabrics with mylar treatments, florescent tubes, and we handed out squares of mylar sheeting, wire and reflective ribbons to allow the audience to experiment and create something to put atop the coil. Omega Recoil is taking some of our toys out to the East Bay Mini Maker Faire Sunday, October 16th 2011 at the Park Day School campus + Studio One Art Center in the Temescal district of Oakland. Independently-organized but inspired by Maker Faire (and MAKE magazine, makezine.com and craftzine.com), East Bay Mini Maker Faire is a full-blown community fair that brings together science, art, craft, homesteading and engineering plus music, food, workshops, and performance. This family-friendly event showcases the amazing work of all kinds of makers across the East Bay and beyond—anyone who is embracing the DIY or DIT (do-it-together!) spirit. This year, East Bay MIni Maker Faire is featuring the work of over 130 local makers; for the complete list check our Makers and the Schedule pages. For more information, news, and updates, check ebmakerfaire.com. We even have a discount code if you’re ordering tickets at eventbrite just give them the ALL CAPS first word of our name for a 15% discount. See you in the yurt! CNet has a photo and mini blurb of us in their Happy hackers at Maker Faire 2011 (photos). Popular Mechanics has us listed as one of the 10 Coolest DIY Projects From Maker Faire 2011. Saturday, May 21st 2011 @ 12 noon, 1 PM, 4PM, 5:30 PM, and 7 PM. Sunday, May 22nd 2011 @ 10:30 AM, 1:30 PM, 3 PM, and 4 PM. 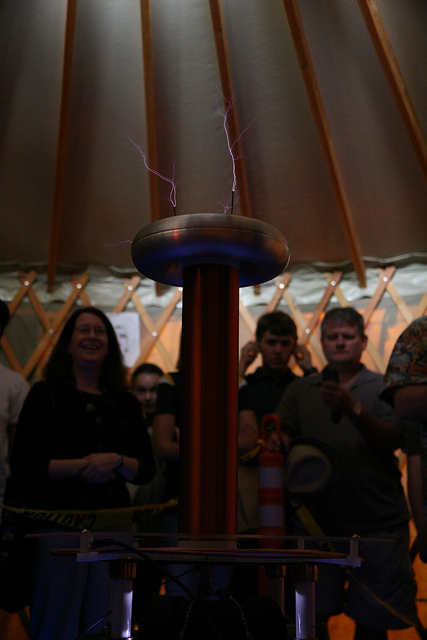 Come see the only solar powered, hand-held Tesla coil at the Bay Area Maker Faire. Omega Recoil is going to be performing at the Bay Area Maker Faire 2011 this year, May 21st and 22nd. Our fellow “coilers” ArcAttack! are going to be on one of the main stages, so we’re leaving the big coil at home. But we’ve got some other toys that we’ll be bringing. More on that later. FORA.tv covered our Maker Faire 2009 presentation, enjoy. Someone in the audience caught this footage of The Rat Show.